Like most people I always hear about those that buy low and sell high but have rarely experience that phenomena myself. The Metro Phoenix real estate market holds a lot of promise for the average investor / homeowner to change their luck. Metro Phoenix real estate has and is going through a tumultuous time, depending upon the survey, study or report, the Phoenix real estate market is horrible and continuing down the path to utter despair with no end in sight. See a recent Forbes report on the 10 Best and Worst US Housing Markets, we made it to number 2! Most would see the glass as half empty if not total dry, like being out in the Phoenix summer 115 degree heat. But it is a dry heat and as it happens every year in Phoenix the temperatures will moderate and with open arms welcome the shivering masses that are escaping the bitter cold from elsewhere in North America. Thus I see this as the glass being half full. Tell me where can you now purchase a principle residence, investment property or vacation home at these prices (2003 levels or lower) and live in an area where everyone wants to either visit to escape the cold and golf, retire to, move to because of the climate and lifestyle or beat the losing investment habit and buy low by getting in at the bottom and sell high in the future while enjoying a respite from the cold. Thus is the Metro Phoenix real estate glass not securely half full? Add the global aging demographic and reports like the following Forbes report highlighting the top 10 cities where Americans are relocating, Phoenix is #4. 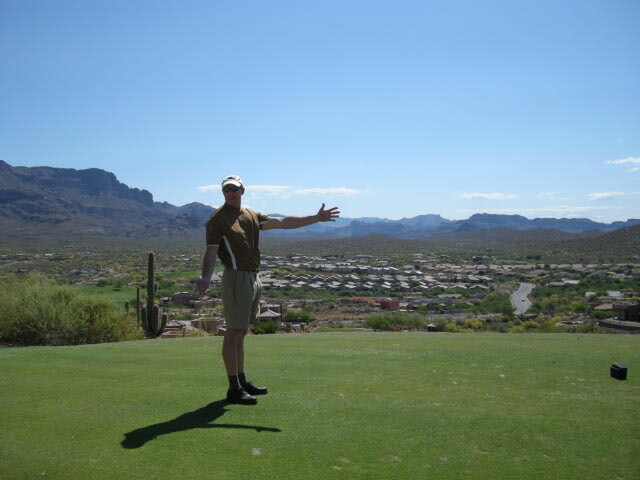 Last month in Phoenix I golfed with 5 different couples that were in Phoenix to get out of the cold and begin the journey of looking to relocate/retire in a more comfortable part of the world. We all read the headlines and hear the dialogue about how the economic sky is falling, the bank and mortgage crises, global equity market realignment, the drop in the price of oil and gas and of course the plummeting value of real estate. With all of the bad news maybe we just need to focus on the glass being half full. Lets focus on Arizona vacation real estate opportunities, although everything mentioned above is also a fantastic opportunity, and why now is one of the best times in history to get into the real estate market. Metro Phoenix is one of the top ten residential real estate markets that got hit hard by the sub prime debacle and the effects of an over inflated real estate rush over the last 5 years. Today the opportunity to pick up well built, located, and priced properties in Metro Phoenix is abundant. Depending upon areas you can purchase an investment or vacation home for 50 to 60% of what it was valued in the peak of the market. Great deals but how to afford the opportunity and investment in today’s market when your net worth has taken a big hit? Unfortunately not everyone has the financial ability to put down $200,000 in cash or take out a large mortgage to leverage the buying opportunities that abound in Arizona, and specifically metro Phoenix. As I mentioned in a previous post, Joint Ownership is a wonderful vehicle to leverage today’s market and real estate opportunities. If you get 3 to 5 families together (2 would even work) and work through the proper processes and requirements (identifying needs, wants, desires and must haves) the capital costs of a vacation home along with the monthly operating expenses can be split evenly between the joint owners. As an example, 5 families split a $400,000 metro Phoenix home (buys you something nice with 5 bed 3 bath, stainless, granite, 3 car garage and pool) then add $50k for any upgrades that might be needed and furniture. Thus you have ownership in a fully furnished vacation home, a 3 hour flight away, for $90,000 all in with a monthly operating cost of around $200. At the end of the day you can probably never use it more than your proportionate share of 2.4 months a year (spread throughout the year). Now you have an asset that will substantially appreciate over time and somewhere to call home when it is minus 40 in Canada. Take a look at what less than $400,000 could buy you in the Metro Phoenix market today. The structure of a Joint Ownership investment is easy and I am happy to assist with that if there is a need. Well it seems like most of Alberta has jumped on the vacation home band wagon and bought something down in Arizona. Just about everyone you talk to has bought, is looking to buy or would love to find something down south to get away from the inevitable cold weather we will be suffering in the Canadian prairies in approximately 5 to 6 months (yes the summer in Canada is way too short). But wait, there is a way the average Canadian can buy a vacation home in the warmer climates and not go broke doing so. Though joint ownership it is possible to purchase a great place down south for no more than the price of a new car. As an example, 5 families split a $250,000 metro Phoenix home (buys you something nice in the 3 bed 2.5 bath in a gated community) then add $50k for any work that might be needed and furniture. Thus you have ownership in a fully furnished vacation home, a 3 hour flight away, for $60,000 all in with a monthly operating cost of around $200. At the end of the day you can probably never use it more than your proportionate share of 2.4 months a year (spread throughout the year). Now you have an asset that will appreciate over time and somewhere to call home when it is minus 40 in Canada. New Blog post I will cover off some of the things you need to consider when you go the joint ownership route.